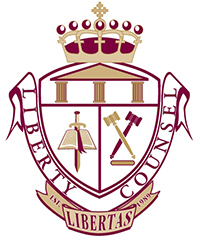 Liberty Counsel™ is an international nonprofit litigation, education, and policy organization dedicated to advancing religious freedom, the sanctity of life, and the family since 1989, by providing pro bono assistance and representation on these and related topics. With offices in Florida, Virginia, Texas, Washington, D.C., and Jerusalem, Israel, Liberty Counsel has hundreds of advocates around the world. Recognized by the IRS as a 501(c)(3) organization, Liberty Counsel is funded by tax-deductable donations from concerned individuals, churches and organizations. Liberty Counsel provides pro bono legal assistance in the areas of religious liberty, the sanctity of human life and the family. Liberty Counsel’s Board of Directors has adopted a Christian doctrinal statement, but Liberty Counsel does not limit its services to Christians, as the rights of Christians are affected positively by defending the rights of others.